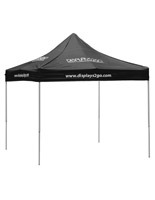 This 10 x 10 black pop-up canopy is designed for use in outdoor or indoor locations. 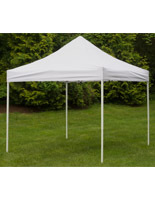 A powder-coated steel frame easily expands to hold the polyester tent cover. 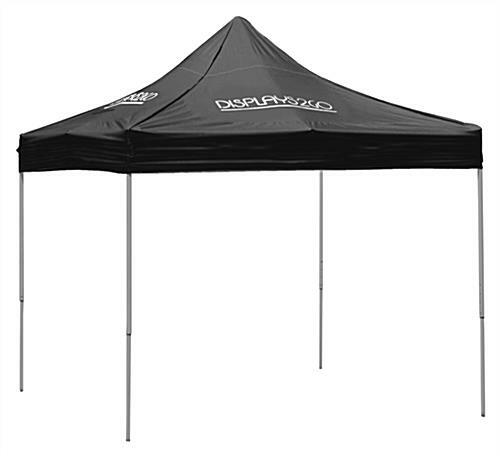 Each collapsible pop-up canopy comes with its own carrying case. Users can quickly fold up the frame of the party tent and store in the case to take to the next tradeshow or event. 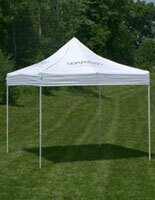 On sunny days, this pop-up canopy provides much needed shade. 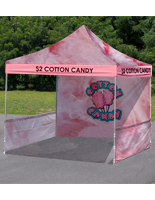 Customize the tent cover with up to 4 imprints, on either the top or valences of the party tent. 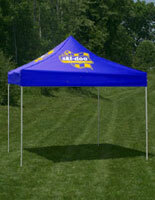 Please Note: When creating artwork for your tent, the prices below are for (1) Canopy Image and (1) Valance Image. For different images on the sides of your tent, contact our call center for a special quote. 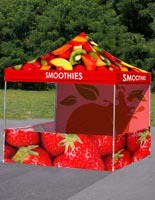 120.0" x 133.0" x 120.0"
An in-stock lead time of 7 business day(s) begins after the artwork proof has been approved. Product does NOT ship on a same day basis.